2007 Dec;21(12):1153-8.Anti-herpes simplex virus activities of Eugenia caryophyllus (Spreng.) Bullock & S. G. Harrison and essential oil, eugenol. 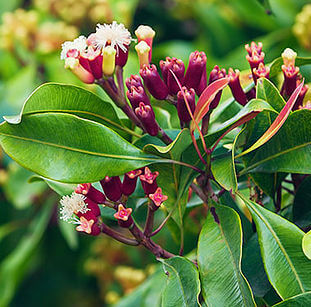 In this study, an extract from the flower buds of Eugenia caryophyllus (Spreng.) Bullock & S. G. Harrison and the essential oil, eugenol, were evaluated for their anti-herpes simplex virus properties on standard HSV-1(F), standard HSV-2(G) and ten HSV isolates. The plaque reduction assay showed that HSV-1(F), HSV-2(G), two HSV-1 isolates (2, 30) and four HSV-2 isolates (1, 2, 3, 21) were inhibited by E. caryophyllus. Only HSV-1 isolates 1 and 30 were inhibited by eugenol. Thus, strains or isolates of viruses may affect the range of inhibition. Moreover, particles of HSV standard strains were directly inactivated by E. caryophyllus and eugenol. The total virus yield of HSV standard strains and isolates at 30 h also declined after treatment with E. caryophyllus and eugenol. The E. caryophyllus extract exerted higher antiviral replication on HSV-2(G) than on HSV-1(F). The inhibition of the viral yield of HSV-1 isolates was higher than standard HSV-1(F) and standard HSV-2(G) was also inhibited more than most of the HSV-2 isolates. The anti-HSV activity of eugenol against HSV-1(F) and HSV isolates was stronger than with the E. caryophyllus crude extract. However, the percentage inhibition was more pronounced on HSV-1(F) than on HSV-2(G). Moreover, HSV-1(1) and HSV-2(1, 32) could not replicate when eugenol was included in the assay.